The Black Rep’s latest production is a compelling drama from one of America’s most celebrated playwrights, August Wilson. An installment in his cycle of plays chronicling the experience of African Americans in each decade of the 20th Century, Seven Guitars is a thoughtful, extremely well characterized play that presents the plight of various characters and their hopes and dreams in 1948 Pittsburgh. 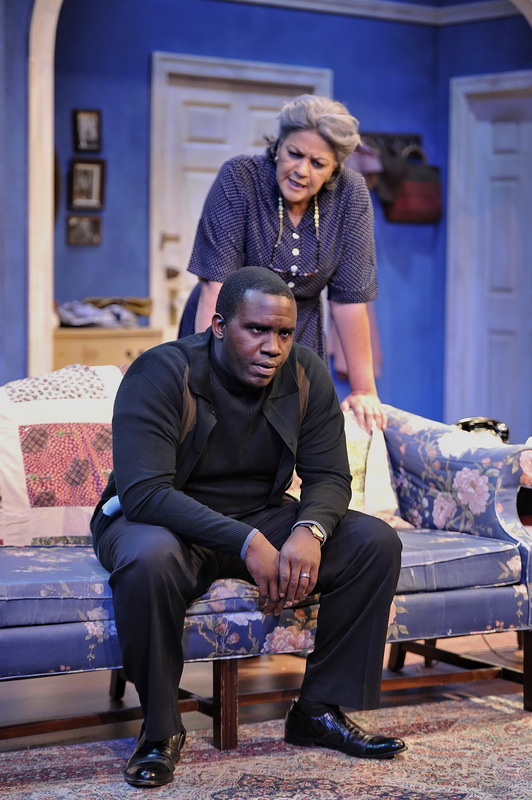 The Black Rep’s production is highlighted by thoughtful staging and a top-notch cast. This is one of those plays that tells us its end at the very beginning. From the start, we know that one of the play’s central characters, blues musician Floyd “Schoolboy” Barton (Kingsley Leggs) has died, and various of his friends are gathered in a backyard after his funeral. What it doesn’t tell us right away, is how Floyd died and what events led up to the gathering in the first scene, and that’s the focus of the story. Most of the play takes place before the initial scene, and we see how Floyd, recently released from prison, tries to re-establish his relationship with girlfriend Vera (Linda Kennedy), and reconnect with fellow musicians Canewell (Phillip Dixon) and Red Carter (Reginald Pierre) and journey to Chicago for a recording session at the record company for which he recorded a previous song that has become a surprise hit. He’s staying with Vera, but Vera’s not so sure she wants Floyd back, since he had previously left her for another woman. Also in the picture are Vera’s neighbors, Louise (Cathy Simpson) and King Hedley (Ron Himes). Hedley, who makes a living selling homemade chicken sandwiches and eggs from the chickens he raises and is treated by the others as something of an eccentric, is full of dreams, regrets, and strong opinions about how black men are treated and oppressed by the white establishment. Louise is waiting for the arrival of her niece Ruby (Lakesha Glover) from out of town, and when Ruby finally arrives she carries with her some secrets of her own. This is a long, complex play with extremely well-drawn characters and unfolding situations that build gradually and, eventually, explosively. The direction is deliberate and the cast is ideally chosen, led by Leggs in a compelling performance as the ambitious Floyd. He’s also got a great voice and performs well on the guitar during the show’s musical moments. Himes is also extremely strong as the determined, complex Hedley, as is Kennedy as the conflicted Vera. The whole cast is strong, and the musical performances featuring Leggs, Pierre, and Dixon are memorable as well. It’s a cohesive cast, bringing a lot of energy and weight to Wilson’s excellent script. The technical aspects of the production are well-presented in Tim Case’s detailed set and Michael Alan Stein’s excellent period-specific costumes. Jim Burwinkel’s lighting adds a lot to the mood of the production, as does Maril Whitehead’s sound, particularly in the musical moments of the show. Seven Guitars is a long play, but Wilson’s superb dialogue and story pacing, along with the excellent performances of the cast, makes every minute count. This is a gripping story that provides a great deal to think about in terms of how things used to be, as well as how they still are a lot of the time. It’s a memorable production from the Black Rep. The Black Rep is presenting Seven Guitars at Harris-Stowe University’s Emerson Performance Center until April 23, 2017. A Raisin In the Sun is a classic of the American stage. It’s so widely respected that it’s often assigned reading for high school and middle school English classes, which is why I brought my teenage son to the latest production at the Black Rep. He had read it in class last year, and it had been one of his favorite assignments. Sadly, I have to admit I’d never actually seen a production of the play before, so it was an introduction of sorts to me. One of the frustrating things about being a theatre fan is that no matter how many great plays I see, there are always a few that I manage to miss for whatever reason, and I’m very glad I was able to finally see this remarkable play at the Black Rep. Not only is Lorraine Hansberry’s script still as vibrant and timely as ever; the excellent cast and direction in this production makes it a must-see for anyone who appreciates great theatre. There is so much going on in this multi-layered story that it’s somewhat difficult to adequately describe. The story follows the Younger family–a working-class African American family who share cramped living quarters in a run-down Chicago apartment. The matriarch, Lena (Andrea Frye) is expecting an insurance payment from her late husband’s policy, and her son Walter Lee (Ronald L. Conner), who works as a chauffeur, has high hopes for investing the money on a risky business venture, despite his mother’s wishes to the contrary. Sharing the small living space with Walter and his mother are Walter’s wife Ruth (Thyais Walsh), their school-aged son Travis (Keshon Campbell) and Walter’s younger sister, college student Beneatha (Sharisa Whatley), who has hopes of attending medical school. While Walter bemoans his station in life and always seeks to find a get-rich-quick scheme, Ruth yearns for a better relationship with her increasingly neglectful husband, and Lena remembers the ideals of her late husband and hopes for a better life for her children. Meanwhile, Beneatha examines her own ideals and future hopes as she is courted by two very different men, the wealthy, complacent George Murchison (Nicolas G. Tyborn), and Nigerian student Joseph Asagai (L. A. Williams), who encourages Beneatha to embrace her cultural heritage and has idealistic hopes for change in his own country. There’s also Karl Lindner (Joe Hanrahan), a white “neighborhood representative” who presents a tempting but highly questionable proposal to the family upon their attempt to move into a bigger house in an all-white neighborhood. Although society has changed in many ways since the play’s setting in the late 1950’s, unfortunately a lot of the issues dealt with in the play are still very present today. Racial injustice, both personally and systemic, is still a very real issue in today’s world, and the current tensions in St. Louis and across the country are evidence of that. Lorraine Hansberry’s script is extremely well-structured and manages to achieve the feat of putting the focus on issues affecting people while keeping the people at the forefront. The people here are fully realized characters with very well-structured story arcs, and in the hands of director Ed Smith and the immensely strong cast, these characters are brought to vivid, achingly real life. We sympathize, empathize and root for them. We want Lena’s hopes for her children to be realized. We wish the world was a different place, and that the dilemma presented by Lindner’s character wasn’t a reality. 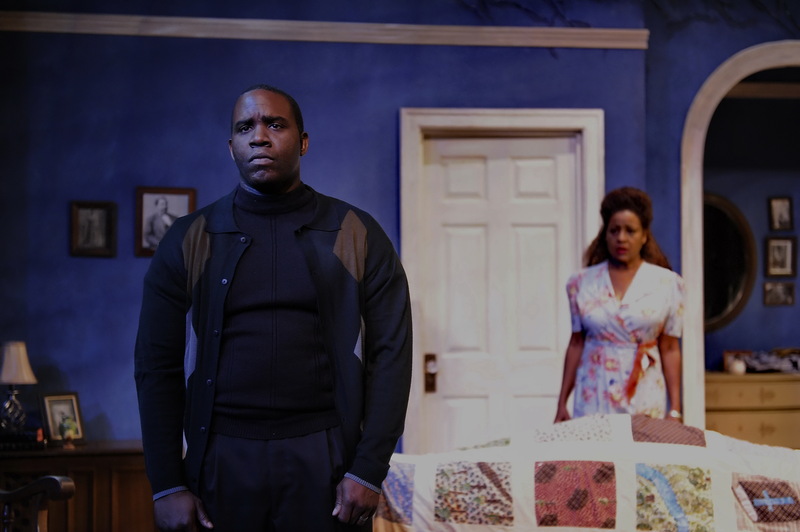 The play also manages to make fully realized characters out of two important people who never actually appear onstage–Walter’s scheming friend Willy Harris and his deceased but never forgotten father, “Big Walter”. These figures have important roles in the action even though we don’t see them. The cast here is ideal across the board, led by Frye’s indelible performance as Lena. Exhibiting a strong sense of individual and family pride, dignity, and love, her Lena is the emotional center of this production. Conner is equally memorable as Walter, convincingly bringing the character’s mixture of frustration and hope to the stage, and bringing real strength and energy to his ultimate confrontation with Lindner. Walsh as Ruth is excellent as the concerned, and exhausted, wife and mother, especially in her scenes with Conner and Frye, and Whatley embodies the combination of idealism and exasperation with the state of society as Beneatha. Her scenes with Williams, charming as Asagai, are a highlight of this production. There are also strong performances from Tayborn as George, Campbell as young Travis, Philip Dixon in a small role as Walter’s friend Bobo, and Hanrahan in the difficult role of the outwardly polite but inwardly weaselly Lindner. It’s a cast not only of great individual performances, but of excellent group chemistry as well, and there is never a dull moment as we spend over two hours with this family and share their hopes, disappointments and struggles. The technical elements of this production are also of extremely high quality. The set, designed by Jim Burwinkel, is so meticulously crafted as to not only provide a suitable backdrop for the play’s action, but also to shed additional light on who these characters are as people. The apartment is small–clearly too small to adequately accommodate the five people who share it, and the plaster on the walls is obviously cracking, but this place has also just as obviously been as well-maintained as possible. With family photos one the walls, and the tiny kitchen space cramped but organized, the set is a witness particularly to Lena’s care, attention, and above all, love for her family. Linda Kennedy’s costumes are fittingly styled to the period, and individually suited to each character, and Burwinkel’s lighting is focused and appropriately atmospheric. As much as I regret never having seen this play before, I’m glad that it was this production that introduced me to it on stage. It’s a powerful representation of one family’s struggles, but also a reflection of how far we still need to progress as a society. In a world where racial tensions and inequities are still very much a reality, a play like this is as important as ever, and the Black Rep’s production is a stunning realization of this essential work of theatre. Whether you have seen or read this play before or not, this is a production not to be missed.